Valentine was a holy priest in Rome, who, with St. Marius and his family, assisted the martyrs in the persecution under Claudius II. He was apprehended, and sent by the emperor to the prefect of Rome, who, on finding all his promises to make him renounce his faith ineffectual, commanded him to be beaten with clubs, and afterwards, to be beheaded, which was executed on February 14, about the year 270. Pope Julius I is said to have built a church near Ponte Mole to his memory, which for a long time gave name to the gate now called Porta del Popolo, formerly, Porta Valetini. The greatest part of his relics are now in the church of St. Praxedes. His name is celebrated as that of an illustrious martyr in the sacramentary of St. Gregory, the Roman Missal of Thomasius, in the calendar of F. Fronto and that of Allatius, in Bede, Usuard, Ado, Notker and all other martyrologies on this day. To abolish the heathens lewd superstitious custom of boys drawing the names of girls, in honor of their goddess Februata Juno, on the fifteenth of this month, several zealous pastors substituted the names of saints in billets given on this day. The origin of St. Valentine, and how many St. Valentines there were, remains a mystery. One opinion is that he was a Roman martyred for refusing to give up his Christian faith. Other historians hold that St. Valentine was a temple priest jailed for defiance during the reign of Claudius. Whoever he was, Valentine really existed because archaeologists have unearthed a Roman catacomb and an ancient church dedicated to Saint Valentine. In 496 AD Pope Gelasius marked February 14th as a celebration in honor of his martyrdom. The first representation of Saint Valentine appeared in a The Nuremberg Chronicle, a great illustrated book printed in 1493. [Additional evidence that Valentine was a real person: archaeologists have unearthed a Roman catacomb and an ancient church dedicated to Saint Valentine.] Alongside a woodcut portrait of him, text states that Valentinus was a Roman priest martyred during the reign of Claudius the Goth [Claudius II]. Since he was caught marrying Christian couples and aiding any Christians who were being persecuted under Emperor Claudius in Rome [when helping them was considered a crime], Valentinus was arrested and imprisoned. Claudius took a liking to this prisoner — until Valentinus made a strategic error: he tried to convert the Emperor — whereupon this priest was condemned to death. He was beaten with clubs and stoned; when that didn’t do it, he was beheaded outside the Flaminian Gate [circa 269]. St. Valentine was a Priest, martyred in 269 at Rome and was buried on the Flaminian Way. He is the Patron Saint of affianced couples, bee keepers, engaged couples, epilepsy, fainting, greetings, happy marriages, love, lovers, plague, travellers, young people. He is represented in pictures with birds and roses. Saint Valentine (in Latin, Valentinus) is a widely recognized third-century Roman saint commemorated on February 14 and associated since the High Middle Ages with a tradition of courtly love. Nothing is reliably known of St. Valentine except his name and the fact that he died on February 14 on Via Flaminia in the north of Rome. It is uncertain whether St. Valentine is to be identified as one saint or two saints of the same name. Several different martyrologies have been added to later hagiographies that are unreliable. For these reasons this liturgical commemoration was not kept in the Catholic calendar of saints for universal liturgical veneration as revised in 1969, although he continues to be honoured on February 14th in the extraordinary-form Roman calendar of saints. But the “Martyr Valentinus who died on the 14th of February on the Via Flaminia close to the Milvian bridge in Rome” still remains in the list of officially recognized saints for local veneration. Saint Valentine’s Church in Rome, built in 1960 for the needs of the Olympic Village, continues as a modern, well-visited parish church. Today, Saint Valentine’s Day, also known as the Feast of Saint Valentine, is an official feast day in the Anglican Communion, as well as in the Lutheran Church. In the Eastern Orthodox Church, Saint Valentine the Presbyter is celebrated on July 6 and Hieromartyr Saint Valentine (Bishop of Interamna, Terni in Italy) is celebrated on July 30. Notwithstanding, because of the relative obscurity of this western saint in the East, members of the Greek Orthodox Church named Valentinos (male) or Valentina (female) may celebrate their name day on the Western ecclesiastical calendar date of February 14. In the Roman Catholic Church the name Valentinus does not occur in the earliest list of Roman martyrs, compiled by the Chronographer of 354. But it already can be found in the Martyrologium Hieronymianum, which was compiled, from earlier local sources, between 460 and 544. The feast of St. Valentine of February 14 was first established in 496 by Pope Gelasius I, who included Valentine among all those “… whose names are justly reverenced among men, but whose acts are known only to God.” As Gelasius implies, nothing was yet known to him about his life. The Catholic Encyclopedia and other hagiographical sources speak of three Saint Valentines that appear in connection with February 14. One was a Roman priest, another the bishop of Interamna (modern Terni) both buried along the Via Flaminia outside Rome, at different distances from the city. The third was said to be a saint who suffered on the same day with a number of companions in the Roman province of Africa, for whom nothing else is known. Though the extant accounts of the martyrdoms of the first two listed saints are of a late date and contain legendary elements, a common nucleus of fact may underlie the two accounts and they may refer to one single person. According to the official biography of the Diocese of Terni, Bishop Valentine was born and lived in Interamna and was imprisoned and tortured in Rome on February 14, 273, while on a temporary stay there. His body was buried in a hurry at a nearby cemetery and a few nights later his disciples came and carried him home. Τhe Roman Martyrology, the Catholic Church’s official list of recognized saints, for February 14 gives only one Saint Valentine; a martyr who died on the Via Flaminia. The inconsistency in the identification of the saint is replicated in the various vitae that are ascribed to him. A commonly ascribed hagiographical identity appears in the Nuremberg Chronicle (1493). Alongside a woodcut portrait of Valentine, the text states that he was a Roman priest martyred during the reign of Claudius II, known as Claudius Gothicus. He was arrested and imprisoned upon being caught marrying Christian couples and otherwise aiding Christians who were at the time being persecuted by Claudius in Rome. Helping Christians at this time was considered a crime. Claudius took a liking to this prisoner – until Valentinus tried to convert the Emperor – whereupon this priest was condemned to death. He was beaten with clubs and stones; when that failed to kill him, he was beheaded outside the Flaminian Gate. Various dates are given for the martyrdom or martyrdoms: 269, 270, or 273. Another popular hagiography describes Saint Valentine as the former Bishop of Terni, a city in southern Umbria, in what is now central Italy. While under house arrest of Judge Asterius, and discussing his faith with him, Valentinus (the Roman pronunciation of his name) was discussing the validity of Jesus. The judge put Valentinus to the test and brought to him the judge’s adopted blind daughter. If Valentinus succeeded in restoring the girl’s sight, Asterius would do anything he asked. Valentinus laid his hands on her eyes and the child’s vision was restored. Immediately humbled, the judge asked Valentinus what he should do. Valentinus replied that all of the idols around the judge’s house should be broken, the judge should fast for three days, and then undergo baptism. The judge obeyed and as a result, freed all the Christian inmates under his authority. The judge, his family and forty others were baptized. Valentinus was later arrested again for continuing to serve Jesus and was sent to the prefect of Rome, to the emperor Claudius himself. Claudius took a liking to him until Valentinus tried to lead Claudius to Jesus, whereupon Claudius refused and condemned Valentinus to death, commanding that Valentinus either renounce his faith or he would be beaten with clubs, and beheaded. Valentinus refused and Claudius’ command was executed outside the Flaminian Gate February 14, 269. The name “Valentine”, derived from valens (worthy, strong, powerful), was popular in Late Antiquity. About eleven other saints having the name Valentine are commemorated in the Roman Catholic Church. Some Eastern Churches of the Western rite may provide still other different lists of Saint Valentines. The Roman martyrology lists only seven who died on days other than February 14: a priest from Viterbo (November 3); a bishop from Raetia who died in about 450 (January 7); a fifth-century priest and hermit (July 4); a Spanish hermit who died in about 715 (October 25); Valentine Berrio Ochoa, martyred in 1861 (November 24); and Valentine Jaunzarás Gómez, martyred in 1936 (September 18). It also lists a virgin, Saint Valentina, who was martyred in 308 (July 25) in Caesarea, Palestine. Saint Valentine was not exceptionally more venerated than other saints and it seems that in England no church was ever dedicated to him. There are many churches containing the name of Valentine in other countries. A 5th or 6th century work called Passio Marii et Marthae made up a legend about Saint Valentine’s Basilica (it:Basilica di San Valentino) being dedicated to Saint Valentine in Rome. A later Passio repeated the legend and added the adornment that Pope Julius I (357-352) had built the ancient basilica S. Valentini extra Portam on top of his sepulchre, in the Via Flaminia. This church was really named after a 4th-century tribune called Valentino, who donated the land it’s built on. It hosted the martyr’s relics until the thirteenth century, when they were transferred to Santa Prassede, and the ancient basilica decayed. The Legenda Aurea of Jacobus de Voragine, compiled about 1260 and one of the most-read books of the High Middle Ages, gives sufficient details of the saints for each day of the liturgical year to inspire a homily on each occasion. The very brief vita of St Valentine has him refusing to deny Christ before the “Emperor Claudius” in the year 280. Before his head was cut off, this Valentine restored sight and hearing to the daughter of his jailer. Jacobus makes a play with the etymology of “Valentine”, “as containing valour”. English eighteenth-century antiquarians Alban Butler and Francis Douce, noting the obscurity of Saint Valentine’s identity, suggested that Valentine’s Day was created as an attempt to supersede the pagan holiday of Lupercalia (mid-February in Rome). This idea has lately been dismissed by other researchers, such as Professor Jack B. Oruch of the University of Kansas, Henry Ansgar Kelly of the University of California, Los Angeles and Associate Professor Michael Matthew Kaylor of the Masaryk University. Many of the current legends that characterize Saint Valentine were invented in the fourteenth century in England, notably by Geoffrey Chaucer and his circle, when the feast day of February 14 first became associated with romantic love. Oruch charges that the traditions associated with “Valentine’s Day”, documented in Geoffrey Chaucer’s Parliament of Foules and set in the fictional context of an old tradition, did not exist before Chaucer. He argues that the speculative explanation of sentimental customs, posing as historical fact, had their origins among 18th-century antiquaries, notably Alban Butler, the author of Butler’s Lives of Saints, and have been perpetuated even by respectable modern scholars. 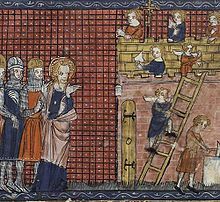 In the French 14th-century manuscript illumination from a Vies des Saints (illustration above), Saint Valentine, bishop of Terni, oversees the construction of his basilica at Terni; there is no suggestion here that the bishop was a patron of lovers. During the Middle Ages it was believed that birds paired couples in mid-February. This was then associated with the romance of Valentine. Although all these legends may differ in ways, Valentine’s day is widely recognized as a day for romance and devotion. The flower-crowned skull of St. Valentine is exhibited in the Basilica of Santa Maria in Cosmedin, Rome. In 1836, some relics that were exhumed from the catacombs of Saint Hippolytus on the Via Tiburtina, then near (rather than inside) Rome, were identified with St Valentine; placed in a casket, and transported to the procession to the high altar for a special Mass dedicated to young people and all those in love. Also in 1836, Fr. John Spratt, an Irish priest and famous preacher, was given many tokens of esteem following a sermon in Rome. 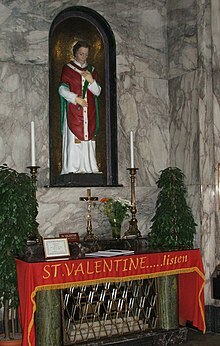 One gift from Pope Gregory XVI were the remains of St. Valentine and “a small vessel tinged with his blood.” The Reliquary was placed in Whitefriar Street Church in Dublin, Ireland, and has remained there until this day. This was accompanied by a letter claiming the relics were those of St. Valentine. Another relic was found in 2003 in Prague in Church of St Peter and Paul at Vyšehrad. Alleged relics of St. Valentine also lie at the reliquary of Roquemaure in France, in the Stephansdom in Vienna, in Balzan in Malta and also in Blessed John Duns Scotus’ church in the Gorbals area of Glasgow, Scotland. There is also a gold reliquary bearing the words ‘Corpus St. Valentin, M’ (Body of St. Valentine, Martyr) at The Birmingham Oratory, UK, in one of the side altars in the main church. 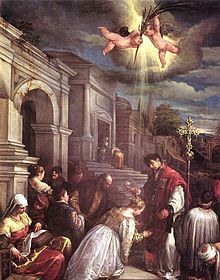 Saint Valentine remains in the Roman Catholic Church’s official list of saints (the Roman Martyrology), but, in view of the scarcity of information about him, his commemoration was removed from the General Calendar for universal liturgical veneration, when this was revised in 1969. It is included in local calendars of places such as Balzan in Malta. Some[who?] still observe the calendars of the Roman Rite from the Tridentine Calendar until 1969, in which Saint Valentine was at first celebrated as a simple feast, until 1955, when Pope Pius XII reduced the mention of Saint Valentine to a commemoration in the Mass of the day. It is kept as a commemoration by Traditionalist Roman Catholics who — in accordance with the authorization given by Pope Benedict XVI’s motu proprio Summorum Pontificum of July 7, 2007 — use the General Roman Calendar of 1962 and the liturgy of Pope John XXIII’s 1962 edition of the Roman Missal, and, as a Simple Feast, by Traditionalist Roman Catholics who use the General Roman Calendar as in 1954. February 14 is also celebrated as St. Valentine’s Day in other Christian Churches; in the Church of England, for example, it was included in Calendars before the Reformation, and S.Valentine, Bishop and Martyr, was restored to the Church’s Calendar in the 1661/1662 Book of Common Prayer. He remains in the Calendars of the Church of England and in those of most other parts of the Anglican Communion.